Never decorate with anything you plan to cook later. The decoration/food will become a beloved family friend whose demise will be mourned dramatically at the dinner table. In other words, don’t give your kids yet another excuse to not eat vegetables. We started decorating with butternut squash last year when I wanted to drop out of the Jack-o-Lantern of the Week Club for a while. The butternut’s shape is eerily ghost-like, with a few squiggles of a Sharpie finishing the job. 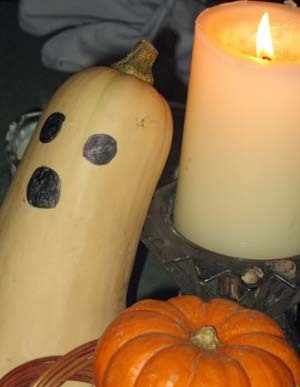 I never got around to cooking last year’s Ghosty, and because he’d hung around the house for so long, the guys remembered the desperation decoration. This year, as soon as pumpkins started showing up around Labor Day, they begged for one. I was able to create a butternut diversion, except this time I bought two: One for the table and one for the tummy. Trouble set in when the table Ghosty fell and gashed his head. We quickly Sharpied the backup butternut and gave it the place of honor in the dining room, relegating his “brother” to the fridge for a dinner to be announced. “What are we having tonight?” Big Guy asked yesterday afternoon. “Macaroni and cheese and butternut squash,” I said. “This,” I said, pulling the first Ghosty from his chilly crypt. “You’re going to cook Ghosty?” Big Guy asked in mock horror. He watched as I lopped off the stem – “Ewwww. I see his brain.” I offered to let him help scoop out the seeds, but he declined. “No way am I touching his guts.” He did agree to spread the butter and brown sugar. “This will make you tasty so we can eat you,” he menaced at Ghosty. An hour later, Ghosty was roasted and ready. I plopped him a serving platter and placed him on the table – unfortunately, I positioned him a little too close to table Ghosty. Tiny tears of horror formed. “Mommy! You cooked Ghosty,” Boots cried. “Yeah, don’t you feel sad for Ghosty?” Big Guy asked. “No, hon. Ghosty is a vegetable. He’s food. He’s dinner,” I said. “Well, I’m not eating him!” Big Guy declared. There’s a 99.9 percent chance that poor dead Ghosty never would have crossed their lips even if not for Big Guy’s puppet show noir. Still holding onto that 0.1 percent, though, I think next year I’ll decorate with crookneck squash. I don’t like that anyway.